Papua New Guinea’s latest batch of recipients of Australian and New Zealand scholarships have been encouraged to be good ambassadors of the country while studying in their respective host countries. Abau MP and Minister for Public Service Sir Puka Temu made this remark to scholarship recipients when addressing a Joint Pre Departure Briefing Program at the Crowne Plaza Hotel this morning. The program included congratulatory remarks and key messages from both the New Zealand High Commissioner to PNG, Marion Crawshaw, and the Head of Aid at the Australian High Commission, Stuart Schaefer. Sir Puka also challenged the recipients to represent the country well at the person to person level, saying their departure from the country’s shores presented them with the opportunity to strengthen such relations with people from their host communities. He challenged them to “make us proud”, stressing that people level relations were just as important as bilateral or business ties between governments and organizations from either countries. 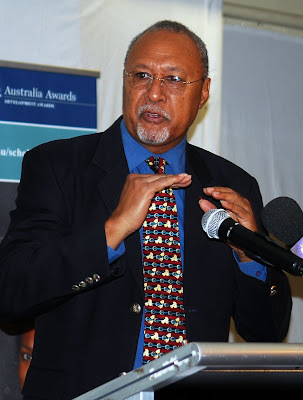 Sir Puka also encouraged the students to “impart PNG ways to people” within their host institutions and communities. The current batch of scholarship recipients numbering over two hundred will take up studies in various New Zealand and Australian universities and colleges beginning in 2013, with the larger segment going under Australian awards. The pre departure briefing program was organized to give participating scholars a brief on scholarship responsibilities, code of conduct as students under scholarship, and other administrative and institutional responsibilities they will be required to observe when abroad. The various scholarship recipients were selected to study under the Australian Development Scholarships, the Australian Leadership Award Scholarships, and New Zealand Scholarships.